11:13:00 AM You can't comprehand the size of these guys until you've seen them. They dwarf rancors. 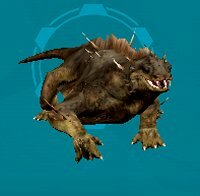 I have one in my house a s a deed and a rancor too and the kimo's big enough for me to move the rancor on top and make it look like it's riding it. 2:48:00 PM hmm yeah on lok last week i noticed 2 wild gurk lairs next to eachother one was "a nest" the other was "a thicket" but both had the same girks spawn from them. i dunno thought i mention it. 6:39:00 AM I have 2, "Baby" and "Honey". Baby is excellent in battle, most of the time obeying my commands. Honey, on the other hand, almost ALWAYS runs away in battle. I wouldn't take anything for Baby. Honey, on the other hand, is just a nice showpiece. 4:11:00 PM Not a very good pet from what my BE friend was saying today. Tend to run away a lot in battle. 8:05:00 PM Can be tamed, I ;ve seen them be used by a ch. However, this is the only pet which can ONLY be obtained for use from a BE.